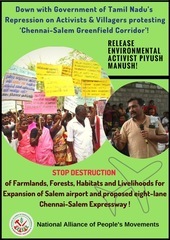 Protest against the fast and murky conception and acceptance of the proposal for building an 8-lane expressway between Salem and Chennai. Issues of land and livelihood rights and ecological degradation. 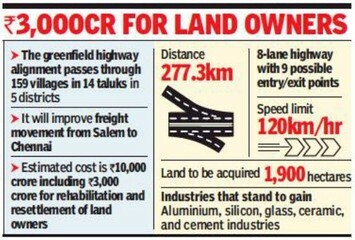 The proposed eight-lane Salem Chennai expressway has been mired in controversies and conflicts sinceits inception, not only in terms of land acquisition, but also since documents revealed that the Rs. 10,000 crore project may have been officially conceived and cleared in just 6 days, and based on a recommendation by a World Bank blacklisted consultant. 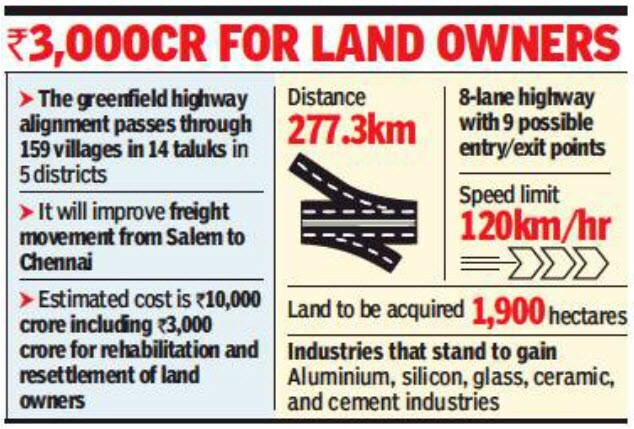 The road will pass through 159 villages in 14 taluks of five districts – Kanchipuram, Tiruvannamalai, Krishnagiri, Dharmapuri and Salem. On August 21, 2018, responding to several petitions filed on this issue, the Madras High Court, directed the state and central governments to not dispossess landowners of their property. This was due to several petitions which had been filed on this issue. However, this was not an order to stop the project. 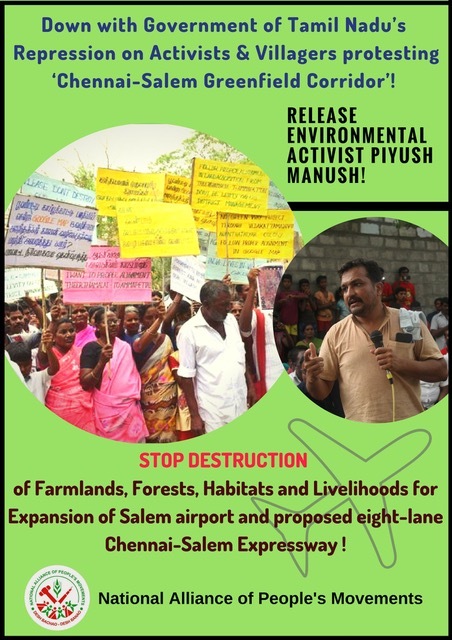 These protests have been met with violence and arrests from the authorities, including several arrests of farmers and local activists as well as renowned environmentalists such as Piyush Manush and Mansoor Ali Khan for speaking against the project . 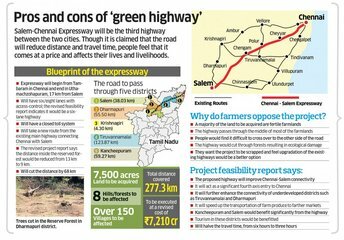 Farmers along the expressway have also alleged harassment by the district authorities . On September 4, 2018, the Madras High Court dismissed a petition challenging the constitutional validity of the land acquisitional process . 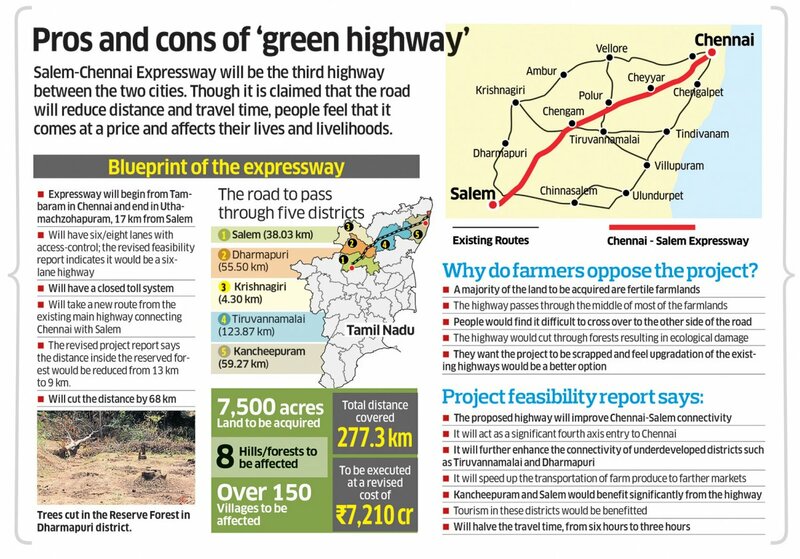 Many villages in the three districts of Salem, Dharmapuri and Tiruvannamalai passed unanimous resolutions to scrap the project on August 15 as well as October 2, 2018. The conflict remains a complex ongoing one, with court cases, attempted self-immolation and protests, harassments and violence, and only time will tell whether it can be considered a success in environmental justice. The expressway will begin in Ariyanur in Salem and end in Vandalur, near Chennai, will pass through the districts of Salem (36.3 km), Dharmapuri (56 km), Krishnagiri (two km), Tiruvannamalai (123.9 km) and Kancheepuram (59.1 km). 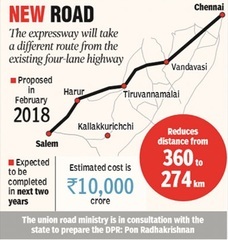 When the expressway is opened to traffic, the travel time between Salem and Chennai will be reduced to three hours. It takes six hours now, through three existing circuitous routes . Why? Explain briefly. This is an ongoining process, since the project came under public eye in February 2018. There have been mulitple forms of protests and subsequent reactions. But it is too soon to form a conclusion about its success. Article about the government claims that only 400 hectares of the total land is arable. Article about the arrest of prominent activists protesting against the project.